Stack in Java is a class which is present in java.util package. A stack is a child class of the vector that implements standard last-in,first-out(LIFO) stack data structure. It only defines the default constructor, which is used to create an empty stack. 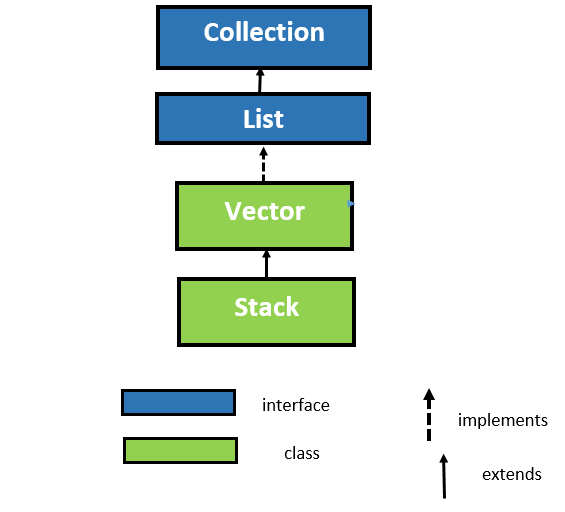 The stack includes all the methods defined by vector class and adds several of its own methods. To put an element at the top of the stack we can use push() method. To remove the top element we can use a pop() method. An EmptyStackException is thrown if you call pop() method and your invoking stack is empty. Read more about: Exception Handling in Java with Example. 1. Object push(Object element): This method is used to push an element at the top of the stack. 2. Object pop(Object element): This method is used to pop the element at the top of the stack. 3. Object peek(): This method is used to returns the elements at the top of the stack, but doesn't remove it. 4. boolean empty(): This method is used to check the stack is empty or not. If the stack is empty returns true, and it returns false if the stack is not empty. 5. int search(Object element): This method is used to search whether a particular element is available in a stack or not. If the element is found in the stack it returns the position of the element else it returns -1.